Cunningham's 'Young Men's Holiday Camp' at Douglas, Isle of Man, is often considered to be the first 'holiday camp' by definition, even though accommodation was provided in the form of tents. It was conceived by Joseph Cunningham, a Liverpool flour dealer, and his wife Elizabeth when they moved to the Island in the mid-1890s and it was still operating, averaging about 50-60,000 campers a year, at the time Billy Butlin opened his first holiday camp in 1936. At the start of the 20th century, other camps were beginning to be constructed with more permanent hut-based accommodation, such as the Caister Camp, (actually 'Caister Socialist Holiday Camp') opened in 1906 by John Fletcher Dodd, a former grocer and a founder member of the Independent Labour Party, at Caister-on-Sea, Norfolk and that was to advertise itself as 'The Oldest Established Camp'. In 1906 when it first started, the camp was still very basic with holidaymakers staying in tents and assisting with camp chores. It was the Caister Camp that inspired 'Pa' Potter to open a similar establishment in Hemsby, Norfolk, called Potters Camp, which was to move to Hopton-on-Sea in 1925 with a further site relocation within the same village in 1933. By the 1930s holiday camp 'chains' were being established at multiple locations. Warner, founded in 1931 by Harry Warner at the Northney site on Hayling Island, opened a further three camps before World War II. Billy Butlin, a South African who was originally a funfair entertainment entrepreneur, became a Warner board member and presided over the construction of their camp in Seaton, Devon in 1935 before starting his own enterprise at Skegness, Lincolnshire in 1936 (employing the same workers who had constructed the Seaton camp) to provide affordable holidays for ordinary families. 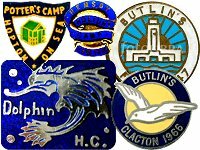 Clacton followed in 1938 and, by 1939, Butlin had a third camp under construction at Filey preparing to join the already existing 200+ camps at various holiday locations throughout the UK. In the same year, Thomas Cook also opened the 58-acre 'Tower Beach' camp in Prestatyn, where week-long 'all in' stays were offered for £3/3/6d (£3.18p). By 1965 the price for a week at the camp had risen to £9. During the first World War the Cunningham's camp had been used for internment and, at the start of WWII, the government soon viewed the burgeoning holiday camp sites as an opportunity to save money and co-opted many of them for a variety of uses, including war worker and refugee housing, military camps and troop training facilities, rather than build their own. Billy Butlin actually sold his incomplete Filey camp to the government, self-contracting the work to finish the camp and including an option that allowed him to buy it back at the end of the war. Known as RAF Hunmanby Moor it was used as a military establishment, as were other camps constructed at Pwllheli and Ayr, the latter which was to become 'Wonderwest World' (now operated by Haven Holidays / Bourne leisure). Filey re-opened in 1945, Skegness and Clacton in 1946, Ayr and Pwllheli in 1947 and the East Ireland resort of Mosney in 1948. Red Island, an Irish holiday camp located on Red Island in Skerries, North County Dublin, was established by Eamonn Quinn in 1948 as a family-run business, similar to that of Butlins. 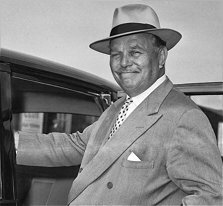 Also in 1948, Billy Butlin acquired two hotels in the Bahamas, with a view to extending his marketing into America, but this particular project was doomed to failure and by 1950 he was again concentrating on the UK market. He continued opening a number of hotels and camps during the 1950s including Saltdean and Brighton in 1953), Blackpool in 1955 and five in Cliftonville during 1955/56. Camps were opened at Bognor Regis in 1960, Minehead in 1962 and Nell’s Point headland on Barry Island in 1966. Fred Pontin also benefited from the war, becoming manager of a camp that was used to house sugar beet and steel workers. With this experience he later bought the 'military' camp at Brean, Somerset, the site of buildings that had been used by US forces practising for the Normandy landings, turning it into his first holiday camp in 1946. At its peak, Pontins operated 25 holiday 'villages'. The holiday camp industry really started to thrive after the end of WWII, continuing through the 50s and well into the 1960s. Pontins, with their 'Go Pontinental' policy, had started to offer holidays in Mediterranean countries by 1963, Warner had 14 camps by 1964 and Billy Butlin opened his 10th holiday camp in 1966. In the 1970s and 1980s, Butlins also operated a number of large hotels, now including one in Spain, and several smaller holiday parks in both England and France. They also operated the 'Top of the Tower' revolving restaurant at the top of the Post Office Tower in London. Butlins 'typified' the view of Sixties holiday camps where accommodation took the form of 'holiday chalets', with toilets and washing facilities in a separate block. You would wake up in the morning to 'Radio Butlin's' broadcast over a PA system with the almost legendary 'Good morning, campers!' clarion call. Children could be looked after by the 'Butlin's Beaver Club' where friendly Redcoats would entertain them in safety while mum and dad enjoyed the rest, or more adult-oriented activities. These were fairly highly organised events at specific times and days, such as sports and other (possibly not now quite 'politically correct') competitions such as Knobbly Knees, Best Head of Hair, Talent, Glamorous Granny, Holiday Princess, Miss Chubby Charming and Cheerful etc. There was plenty of other indoor entertainment and facilities to allow typical British weather to do its worst without spoiling your enjoyment. There were also extensive shopping arcades as well, so you didn't have to leave the site at all. One particularly interesting feature in the camps, although also available elsewhere, was the availability of coin-operated Calibre Auto Recording booths in the late '50s and early '60s, where you could create your own recordings, or aural postcards, on vinyl. For around one shilling you could get about ninety seconds of airtime. In some camps aerial views of the site could be gained aboard a chair lift or even a monorail. Meals were served in communal halls (usually in two sittings) and were no small affair. 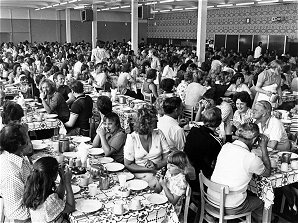 The larger Butlins sites might need to cater for anything up to 10,000 people at one time, serving 200,000 meals a week with an annual consumption of 100 tons of sausages, 3.5 million eggs, 20 million cups of tea (34 tons), 1,570 tons of potatoes, 120,000 gallons of soup and 240 tons of pork chops (8,000+ pigs). Chinese food was also gaining popularity in the late 1950s and 1960s and Billy Butlin introduced chop suey and chips into his holiday camps in 1958! Holidaymakers would pay a fee for their accommodation and decide whether to go full board (all meals would also be included in the price), half board (only the main meal would be included) or self-catering (no meals provided). In the evenings, children could be left in the chalets, patrolled by redcoats, while mum and dad went to play bingo, see a show or just have a drink and a dance. Hawaiian-themed bars were a popular feature where the bar staff wore grass skirts. All the entertainment and activities necessarily had to be fairly strictly organised which led to the impression that these holidays were quite 'regimented'. Although camp staff encouraged participation, nobody forced you to do anything - you could choose what you wanted to do, but not necessarily exactly when you could do it and, if all you wanted was a quiet, peaceful holiday, you were in the wrong place! That being said, once you were there, everything was free if you had booked the 'full board' option. Holidaymakers had the choice whether to go full board (all meals included in the price), half board (only the main evening meal included) or self-catering (provide your own meals, possibly cooked in your chalet). Without doubt, much of the success of the camp depended on the quality of its staff and, for many, it was the staff who provided the best holiday memories. 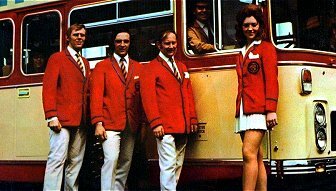 They were generally uniformed (Butlins staff wore red trimmed with blue, Warner staff green and Pontins blue trimmed with white) and had many and varied duties to perform, including the entertainment of both the children and their parents. 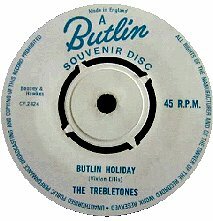 The song with which ballroom entertainment ended each evening in every Butlins holiday camp was 'Goodnight Campers', when the Redcoats would line up in front of the stage with the campers facing them, in lines across the ballroom floor, arms linked in a 'singalong' with their legs gently kicking in time to the music. The very first 'redcoat' was a chap called Norman Bradford at Skegness in 1936. As the story goes, Billy Butlin noticed his popularity with the customers and asked him to 'liven them up a bit'. Such was his success that Billy chose five men and five girls as a team to perform that function all the time, gave them red coats to wear to make them identifiable to the punters, and the rest is history. Many top stars started their careers as 'coats' in the holiday camps. Ex-Butlins Redcoats include Dave Allen, Moira Anderson, Johnny Ball, Jimmy Cricket, Clinton Ford, Russell Grant, Charlie Drake, Roy Hudd, Des O'Connor, Jimmy Tarbuck, Michael Barrymore, Rod Hull, Russ Hamilton, Freddie Davies, Terry Scott, Jimmy Perry, Colin Crompton, Cliff Richard, Isla St Clair, Ted Rogers, Tommy Boyd and many others. Ex-Pontins Bluecoats include Shane Richie, Brian Conley and Lee Mack while Roger deCourcey and Joe Pasquale wore the Warner green uniforms that were supposedly based on the school blazer and tie worn by Captain Harry Warner when he was at school. 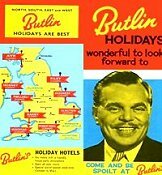 Billy's son, Robert 'Bobby' Butlin, took over the company management in 1968 but the business had peaked at ten holiday camps and it was sold to the Rank Organisation in 1972 for £43 million. The business continued, but the perception of 'organised' and 'regimented' holidays proved to reduce their appeal and the Butlins brand name was hardly used at all by the end of the 1980s. During that period of the late 60s and early 70s the domestic holiday market began to decline as more people started to take advantage of cheap holiday 'packages' offering the opportunity to holiday abroad, in warmer climates. Pontins were not too affected by this as they had already moved into the package holiday market and, in any case, their UK holiday camp was a smaller business than some of the others. The 1973 film 'Holiday on the Buses', a spin-off from the ITV sitcom On the Buses, was filmed at the then brand new Pontins Prestatyn Sands camp in North Wales. Butlins followed suit in downsizing their assets and started purchasing smaller camps, including caravan parks, that they marketed under the name 'Freshfields'. By 1980 the larger holiday camps, with their high running costs, were doomed and the 'Top of the Tower' restaurant lease expired. The Butlins camps at Clacton and Filey closed in 1983 and continuing rises in costs and the number of cheap package holidays available forced further closures. The camp at Barry Island was sold off in 1986 and eventually closed in 1996. Ayr and Pwllheli became 'Haven Parks' in 1998, the same year as most of the company's hotels were sold off. In September 2000, the remaining resorts and brand were sold to Bourne Leisure, under which the Butlins brand name now survives and thrives. As of 2015, only three of the original camp sites remained in use, at Bognor Regis, Minehead and Skegness, under the management of Butlins Skyline, a subsidiary of Bourne Leisure that also operates Warner Leisure Hotels and Haven Holidays.